Adam Peck is Dean of Student Affairs at Stephen F. Austin State University. He earned a doctor of philosophy degree in Higher Education Administration at The University of Texas at Austin. Hollie G. Smith is Assistant Dean of Student Affairs for Programs at Stephen F. Austin State University. She earned a doctor of education degree in Higher Education at Texas A&M University - Commerce. Many have suggested that higher education has a responsibility to teach students about the ethical implications of their actions. Enacting this expectation can be daunting. The concept of student honor codes is nothing new. Many institutions have well-established honor codes. However, interest in student honor codes has had a sudden resurgence in recent years. One explanation for this new interest is the call from many stakeholders to address the issue of civility among today’s college students. Stephen F. Austin State University chose to address the call to teach civility by developing an honor code called, “The SFA Way.” This article discusses the development of this program. The issue of civility on college campuses has become increasingly relevant in recent years with many institutions seeking ways to teach students about their responsibilities to each other. Civility expert and author P. M. Forni wrote, “Being civil means being constantly aware of others and weaving restraint, respect and consideration into the very fabric of this awareness” (Forni, p. 9). In other words, civility begins with an awareness of others. Helping students understand their responsibility to each other can be a daunting task and few models exist to guide colleges and universities in creating this understanding. A study conducted by researchers at the University of Michigan found that today’s college students are less likely to understand the emotions of others than their age group's predecessors. The test group scored 40 percent lower on an empathy test than participants in the same study 20 and 30 years ago (Konrath, 2010). This lack of empathy has caused some to label the current generation, “Generation Me.” Psychologist and educator Dr. Jean Twenge, whose books include, “Generation Me: Why Today's Young Americans Are More Confident, Assertive, Entitled--and More Miserable Than Ever Before” and “The Narcissism Epidemic: Living in the Age of Entitlement,” has researched this generation and found that narcissism appears to be on the rise. There are, of course, always exceptions, but what does it say about the present generation that empathy seems to be declining and narcissism, the unsupported belief in one’s superiority, seems to be growing? In response to the growing trend of incivility, a group of faculty, staff and students developed, “The SFA Way.” It is a statement of the collective beliefs of the university. Clearly the idea of honor codes is nothing new. Many other intuitions have well-established honor codes. Texas A&M has a well-known and respected honor code and The College of William and Mary is said to have one of the first honor codes. What is more unique about the approach at SFA is that the historical approach is being employed in modern times. It is hoped that understanding how the honor code at SFA developed may be beneficial to other institutions that are seeking ways to teach civility to their students. The program was established to mirror the six pillars of character put forth by the Josephson Institute’s Center for Youth Ethics. Their approach was aimed at primary and secondary students. In order to update it for college students, it was important to select values that were important to SFA students and the SFA community. Students were given the chance to say what values they thought were most important during a program that took place as part of our annual Week of Reflection. This is an event that encourages students to look at what they have learned in the present year and how it is changing them. Students were provided a bulletin board with note cards to write what mattered most to them. The cards were sorted into groups and names were selected to best represent each group. The five categories that emerged were named the “Five Root Principles.” They are: Respect, Caring, Responsibility, Unity, and Integrity. The name “root principles” was an important connection to our campus history and tradition. SFA is located in the “Piney Woods” of East Texas and the mascot is a Lumberjack. The naming of the “root principles” connected to this tradition. The group who developed The SFA Way knew that school spirit was an important value for the university community. The school song is well-known by all and is sung at all sporting events and other important occasions. The goal of the group was to make The SFA Way as well-known as the school song. Among the ways the program was marketed to students, faculty, and staff was a professionally designed poster. The poster was designed to have a “timeless” feel. Because of the strong sense of tradition on campus, it was believed that even though the program was new, it needed to look like it had been around for a long time. The poster was also designed to fit into a standard frame size so it would be inexpensive and easy to frame. They are made available for free, every year, to anyone who wants one. This led to wide-spread display of the poster all over campus. The wide variety of offices displaying the posters is an essential element in campus adoption of the program and contributes to students’ perception that it is a centrally held ethic on campus. The program is also marketed through orientation programs, the Jack Camp transition camp, and via public service announcements at athletic events. At the end of the fourth year of The SFA Way, there are very promising signs. 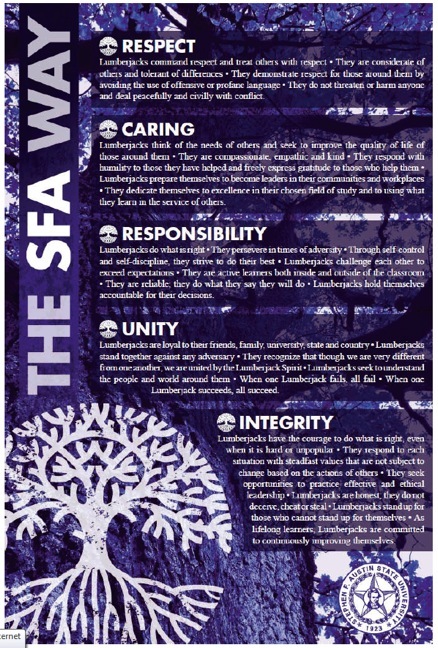 In a survey conducted in April of 2013, nearly 73% of all students could accurately select the five root principles of The SFA Way. Almost 76% of freshmen could identify the correct root principles. The honor code is frequently referenced in letters to the editor when students are calling on each other or even the institution to do what is right, and the Student Government Association developed a pledge to The SFA Way and opens each meeting with this pledge. In the end, the program is accomplishing the goal of providing students a language for discussing ethical issues on campus. The SFA Way provides a useful way to address a growing concern on college campuses. For those who are interested in creating a similar program on their own campus, the full text of The SFA Way can be found at www.sfasu.edu/sfaway. Forni, P.M., (2002). Choosing Civility: The Twenty-Five Rules of Considerate Conduct, St. Martin’s Press. Twenge, J. (2007). Generation Me: Why Today's Young Americans Are More Confident, Assertive, Entitled--and More Miserable Than Ever Before, Free Press. Konrath, S. H, O’Brien, E.H. and Hsing, C. (2010). Changes in Dispositional Empathy in American College Students Over Time: A Meta-Analysis, Personality and Social Psychology Review.